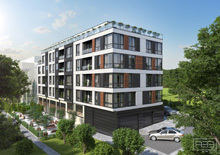 Buy in Bulgaria is offering you three bedroom apartment, located in central Varna. It is on the fifth, last floor in a building, finished in 1994. The apartment is comprised of the following premises: entrance hall, spacious living room with dining area and kitchenette, three bedrooms, bathroom, separate toilet and a spacious balcony. The apartment is offered fully furnished, the bathroom needs renovation. Air conditioners have also been installed. The apartment is facing East – Northeast.